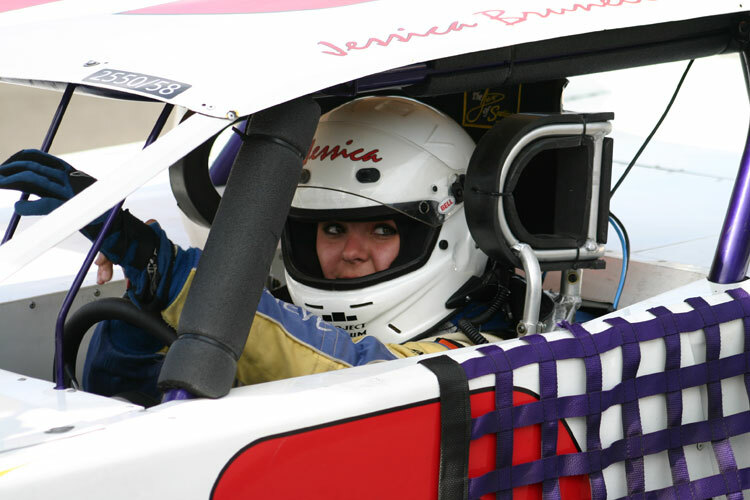 While most 16-year-old teenagers are still besieged with parallel parking woes and earning their driving permits, Jessica Brunelli was busy being crowned the youngest Rookie of the Year ever in the NASCAR American Modified series. "I think that my rookie year in NASCAR went really well, I had a great team to work with and great drivers to learn from. This year we worked with Nascimento Motorsports, and we had a killer set up every time we hit the track, the car was always very well prepared," comments Brunelli, sounding every bit like a seasoned veteran. The crowds were enthusiastically supportive at Roseville for Brunelli, each time her name was announced the applause-meter redlined. "It was really exciting to be racing in front of a crowd for the first time. I loved it," she adds. This wasn't the first time that Brunelli has received Rookie of the Year, in '07, running in the Skip Barber Race Series, she was also award that honor. Clearly though, she understands the importance of the NASCAR award and her level of exhilaration and confidence has been dialed up several notches to reflect it. "I was really surprised when they called my name," says Brunelli. "As for being the youngest in the NASCAR Modified Series ever, I guess that is just icing on the cake." Brunelli first caught the racing-bug at age eight watching her first quarter-midget race. That night after the race she walked out on the track to get a racers view and something just happened, she remembers. "It was like I knew I belonged there." From that point on her sights were set on her tenth birthday, when her dad Bill promised to buy her first go-kart, "and that's when it started." "I have always thought of myself as a racer, no matter what my age, and for the most part, my fellow competitors have treated me fairly. They can see that I'm there to race and that I take racing very seriously," explains Brunelli. Her prior racing experience includes Formula Road racing and USAC Focus Midgets, but it's in her first full season in a NASCAR seat that she's made her greatest gains as a driver. 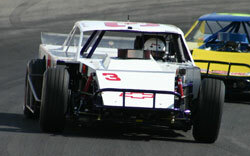 "I am glad we chose to race at All-American Speedway at Roseville for my first year. The competition is some of the best around, which made me a better driver and the third-mile track taught me some really good habits, especially since I was driving something as wild as a Modified. It has over 600HP and not the best of tires and it's hard to keep under you unless you're really smooth with the wheel and the throttle. Driving the NASCAR Late Model was very different, less HP, better tires and suspension. I can't wait to put these skills to use at the '09 D4D (Drive for Diversity Program) Combine." Being accepted into the '09 Drive for Diversity Program was yet another milestone into a young, but already storied race career. The call that she'd been accepted came to her dad's cell phone since Brunelli was home from school, sick with the flu. "I was really happy and relieved to hear that I was being invited back. I think I would have been much more excited if I hadn't have been so sick, but it really hit me later that day, as I started feeling better, that I had really reached a significant goal in my life." "Our relationship with K&N has been great. They took a chance on me this year and it has been an honor to have K&N's support. Everybody knows who K&N is, how great their products are, on and off the race track, and what it means to have their support behind you. I hope I was a great representative for K&N. We use K&N air filters and air cleaner assemblies (both two and four barrel assemblies), as well as the K&N cleaning and charging products. We also use a K&N pre-cleaner. For the engine we use K&N breather elements." Next season is wide open and filled with options, which Brunelli says is just fine with her. "We have begun to be contacted by teams looking at me as a driver. They seem to be leaning towards NASCAR Late Models, or in the NASCAR Camping World Series next year. I will also continue my on and off track training with Ron Sutton's Winners Circle. After that, well, I guess we will see where 2010 leads us. Hopefully, all leading to my dream which is to race in the NASCAR Sprint Cup Series, of course." This just came in to Jessica's camp: In addition to the D4D Combine, she has been invited to test in front of several Sprint Cup and Nationwide Teams, while in Charlotte, at an unrelated test. "This never would have happened without this years NASCAR experience," she adds excitedly.